We decorated this dining room by mixing family heirlooms with a modern chandelier. The antique settee is updated and covered in chocolate leather with nail heads to form a banquet. 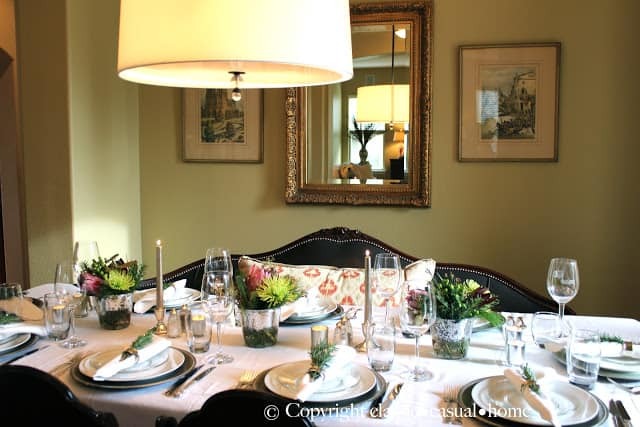 With the white Irish linen and silver, this would also make a pretty setting for an intimate New Year’s Eve party. Notice how Teresa tucked rosemary branches from her garden into the napkin rings. 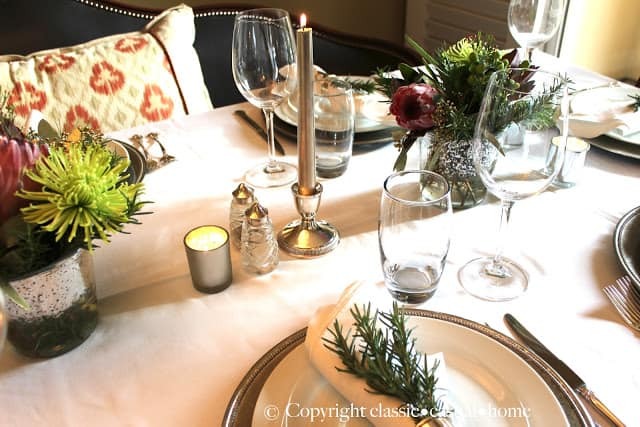 As we sat down to eat, we each placed the rosemary into the bouquets…so fragrant! 1. Dressing: stir the shallot, lemon juice and salt in small bowl and let stand at room temperature 30 minutes. Then add the oil with a small whisk. 2. 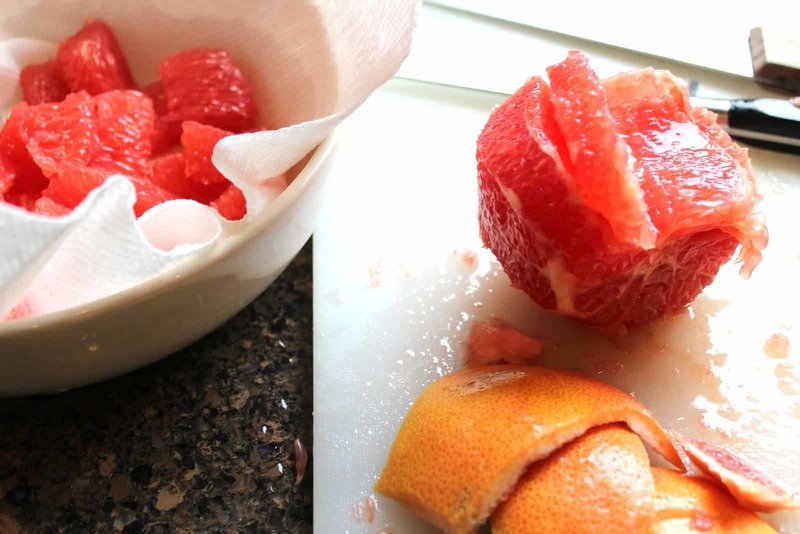 Cut the peal and pith from the grapefruits and take the segments out of the membranes and cut in half…put on paper towels to drain…ok, this was a little time consuming, but worth it. 6. Top each mixture with a handful of the greens and drizzle with the dressing. Sprinkle lightly with sea salt and serve right away. Everyone really liked it. LOOK at this giant box of See’s Candies that my mom received! I’m glad it is still at her house…I’d like a couple candies now! Another thing that I like is a gift that I won from Pink Martini’s and Pearls. 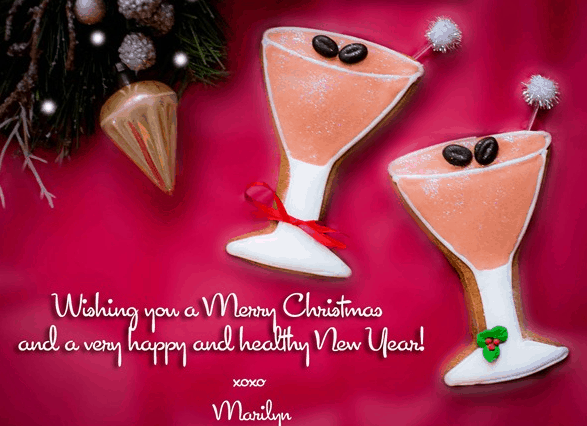 Have you seen Marilyn’s great blog and spectacular cookies? 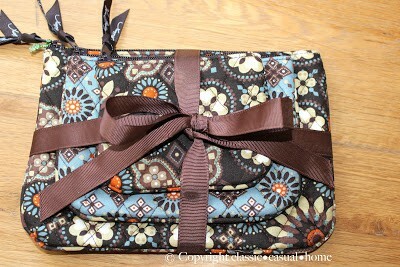 Here are the Vera Bradley cosmetic bags that I won! 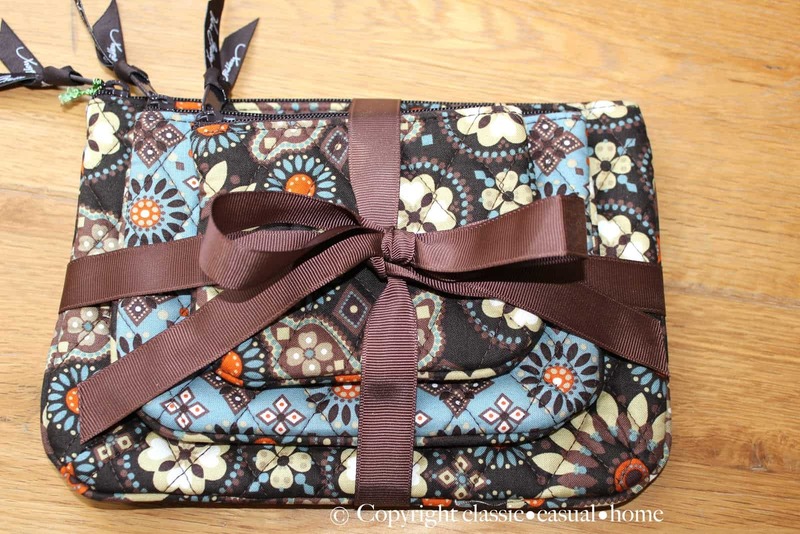 It’s from The Charming Shoppe online. Today is our sweet, funny daughter, Alie’s birthday. She was born 25 years ago on a cold, snowy night in Bronxville, New York. It’s been fun ever since. good health, wisdom and warm hugs. and voice a sincere compliment. We are all in this together, and I am grateful. Looks like a picture perfect Christmas, the table is beautiful. LOVE See's candies, and my mom would be jealous of that great big box….she is a See's fanatic! Marilyn is also so talented…..love seeing all of her amazing creations! Thanks for sharing all this lovliness, happy birthday to your beautiful daughter. Happy Birthday to Alie! Beautiful table for Christmas dinner. Love the flower arrangements and gold candles…very elegant. You're right Mary Ann…would also be perfect for New Year's Eve. So pretty. Happy Birthday Alie. See's candy makes me miss California. That salad is to die for. Such a lovely table! The settee is a nice touch. The food looks delicious! 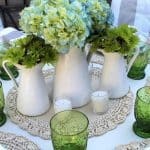 What an elegant table setting! 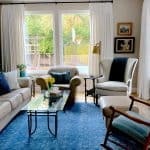 I love the contrast in the settee and chairs…it shows off their beautiful shape and gives them a more modern look. The chocolates & lobster look amazing as well! Your sister's table is beautiful! My Mom loved See's more than anything! She would've loved that box! 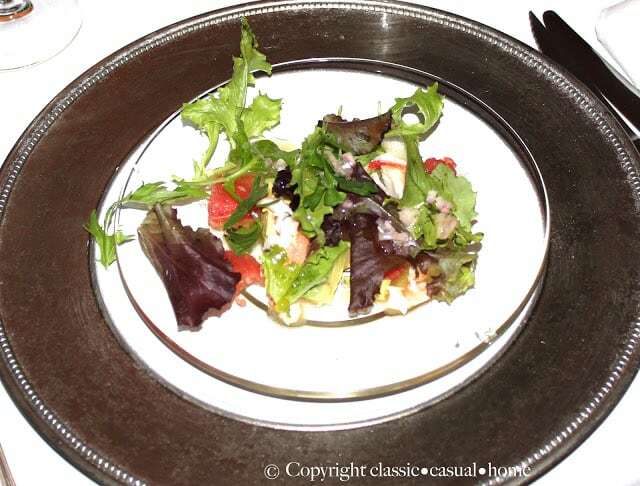 I'm going to try your salad with shrimp (allergic to lobster) for New Year's Eve. Your daughter is beautiful. The table looks beautiful, and the salad looks delish!! Happy New Year to you and your family. 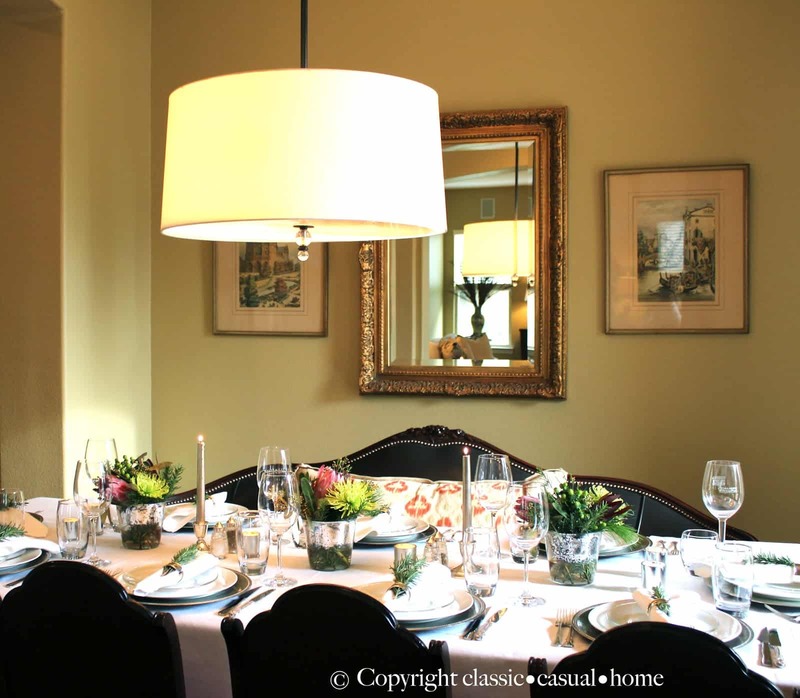 I love the table – so elegant! Happy birthday to your beautiful daughter and best wishes for a happy new year! I see your sister has the same wonderful talent that you do…her table is beautiful. And your salad has my taste buds tingling! Happy birthday to your gorgeous Alie and a very Happy New Year to you and yours! Both sisters are talented and have great taste! Gorgeous table and scrumptious food, wow!! I'm also a NY girl, from Astoria-Queens. Happy birthday to sweet Alie, a very pretty girl too! Happy new year 2013 for you and yours. 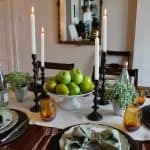 Beautiful table, wonderful dinner! I love that she has a loveseat in place of some of the dining chairs. Aw, happy birthday to your beautiful daughter! 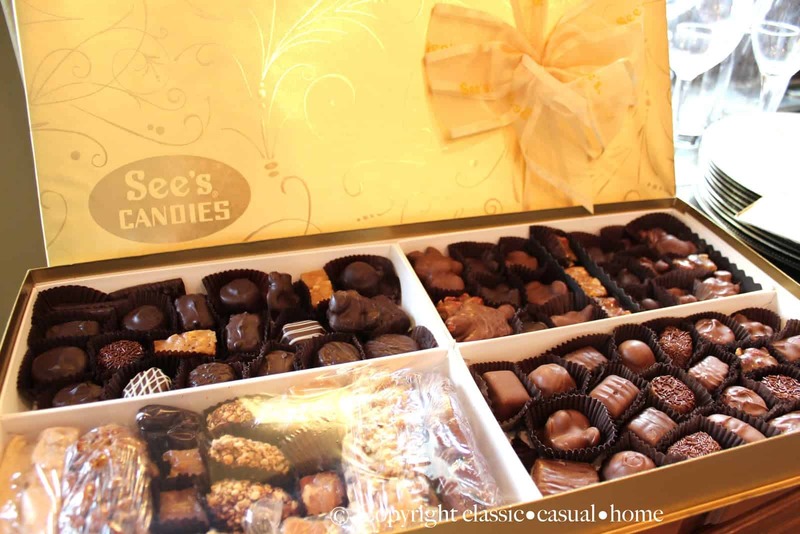 A former co-worker was from California and her Mom used to send us See's candies around the holidays – oh my goodness are they heavenly. Every time a box shows up from a vendor I'm ecstatic. Happy New Year Mary Anne! Lovely post from a lovely blog. Happy New year Mary Ann!! Happy Birthday to your beautiful daughter! 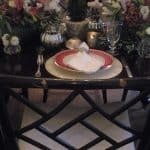 Love your table setting, it's very chic and elegant! The food looks yummy, too. Happy New Year to you! 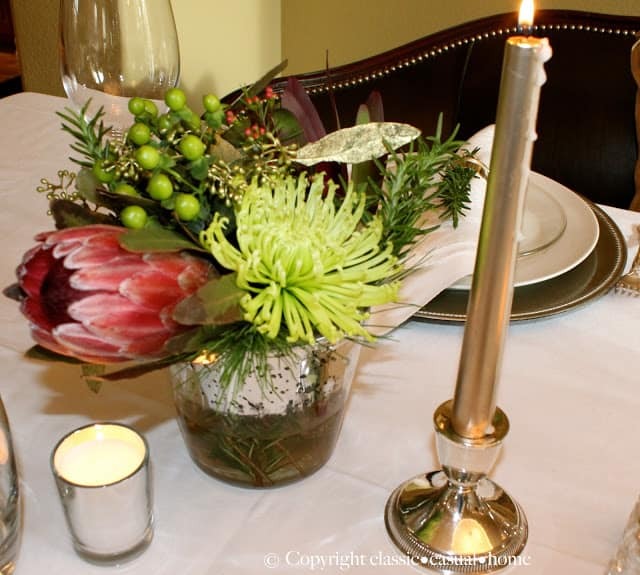 The table is beautiful…love the rosemary! And a happy birthday to your daughter! All the best! You truly are blessed and enjoy by sharing many beautiful things, your design friends, your wonderful family and all your adventures. Many many blessings to you and yours as we enter 2013. Cheers my friend! Such a pretty table…and a beautiful daughter! You are one lucky woman! Have a wonderful new year! Love your sister's table and what you did to the settee is fabulous! 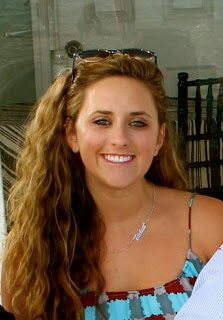 Happy Birthday to Alie you have a gorgeous daughter Mary Ann. Wishing you and your family a bright and Happy New Year!! Everything looks beautiful Mary Ann. I wanted to wish you all the best for this coming year to you and your loved ones. Happy new year! What a beautiful table and delicious menu. Wishing you all the best in 2013, Mary Ann!! UM ANO NOVO LINDO E CALOROSO COMO O BRASIL PARA VOCÊ. SEJAS MUITO FELIZ NESTE ANO. Omgosh! That salad sounds incredible. 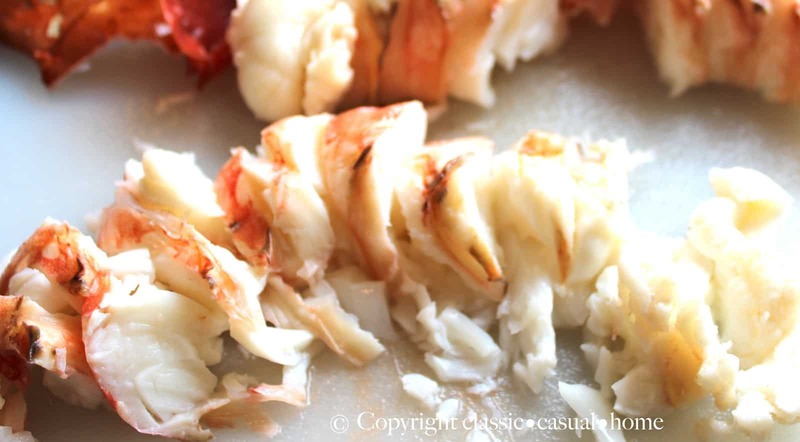 Do you think you could substitute crab for the lobster? I love crab!! Your sister's table is simple and elegant, my favorite look. Wishing YOU a Happy and Content New Year!! Hi Mary Ann, I just stopped by to wish you a happy new years. The table looks lovely and that salad. Well. That just makes me lust after lobster. I should never blog on a empty stomach. Beautiful table and the settee is gorgeous ~ love the color! The flowers are so pretty. I recently posted something similar .. I used mason jars. The low, smaller arrangements allow for easy conversation:) Your salad looks delicious and so funny about the SEES chocolates – ours are sitting here and I wish they would get eaten! Happy Birthday to your daughter! My son turned 24 on the 17th;) Busy month! Have fun tonight and wishing you all a happy and healthy new year ahead!! Hi Mary Ann: I have one big question: where did your sister get the pendant in the dining room?? Did you get it for her? I am, right now, on the hunt for something just like that! Was looking at many sites yesterday. I would like to have 3 bulbs, and a diffuser: is that what we're looking at here? Or….maybe you can advise me? There is a huge range in size and price, but I want something very simple! Thank you!!! We got it at Williams Sonoma Home about six years ago…I don't think they carry it anymore. Happy New Year Mary Ann! Best to you and your family for 2013. Your sister's dining room table is very pretty. I love the settee. Happy Birthday to your daughter. Happy birthday to Ali! She's stunning!! I love that settee! I noticed it immediately! I love a bench, but this takes that to a whole new level! The table and the menu is amazing!! How fun to be with your sister at Christmas! I love the flower arrangements and the rosemary…gorgeous! Mary Ann thank you for sharing this wonderful holiday celebration. You sister's table is beautiful. your salad looks delish and refreshing! Can you believe Ali is 25! The time rolls by us!